Almost everybody I know just adores bubblewrap. This keychain simulates the look, feel and sound of popping bubblewrap. 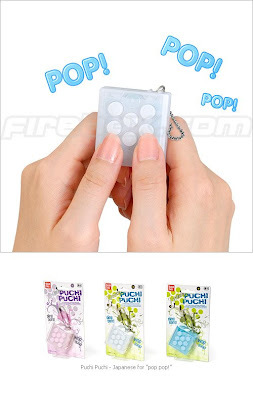 This Bubblewrap Keychain features eight rubbery 'bubble' buttons that activate a realistic popping sound when pressed. But every 100th pop is not just another pop but a random sound: a boing, a bark, a rude noise, a yell, whatever, making it even more addictive, You'll be pushing those buttons like crazy to find out what the next weird noise is. If the word gets out...definitely a danger to society!